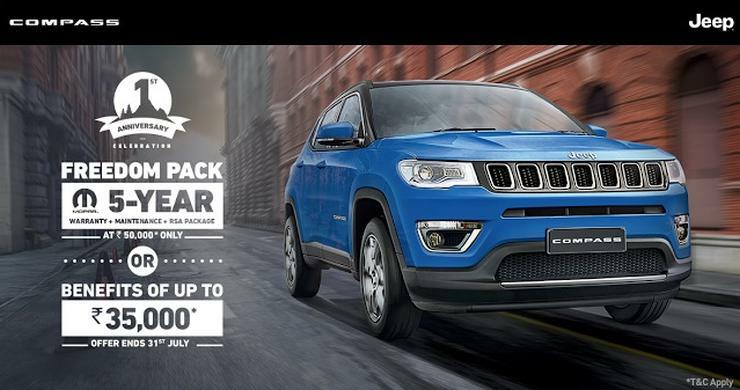 The Jeep Compass has turned one in India, and the American SUV maker has come up with an attractive anniversary offer for buyers. The anniversary offer has two options. The first option is a Rs. 35,000 discount, and the second option is the ‘Freedom’ service pack, now available for Rs. 50,000. The Freedom service pack offers a 5-year warranty, maintenance package and road side assistance, making it very attractive for buyers. It’s highly recommended that they opt for the Freedom pack, which will reduce long-term ownership costs over a span of 5 years. The offer ends in two days. So, you have to hurry. The Jeep Compass has been Fiat Chrysler Automobiles (FCA) India’s best selling car, ever. The SUV was launched last year at an attractive price tag of about Rs. 15 lakhs, and it instantly became a hit, outselling the segment leading Mahindra XUV500 for many months in a row. Now though, sales of the Jeep Compass have hit a slow patch, and have stabilized. The SUV is built in India, at the Tata-Fiat Ranjangaon factory, with a high amount of localisation. In fact, the right-hand drive (RHD) Compass that is produced in India is exported to multiple countries around the world, making India a production hub for the RHD compass. The Compass sold here is available with two engine options – a 1.4-litre turbocharged petrol and a 2.0-litre turbocharged diesel. Both engines get 6-speed manual gearboxes as standard, along with a front-wheel drive layout. The diesel engined Compass gets an all-wheel drive option while the petrol powered one gets a 7-speed, twin-clutch automatic gearbox option. The petrol engine makes 160 Bhp-250 Nm while the diesel engine produces 170 Bhp-350 Nm. Jeep India has plans to introduce a diesel automatic variant of the Compass by the end of this year. Known as the TrailHawk variant, the top-of-the-line variant will get a 9-speed torque converter automatic gearbox, with many off-road focused bits.